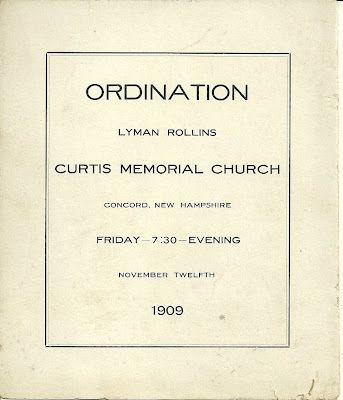 Folded paper giving the program of the Ordination of Lyman Rollins at Curtis Memorial Church, Concord, New Hampshire, Friday - 7:30 - Evening, November 12th, 1909. 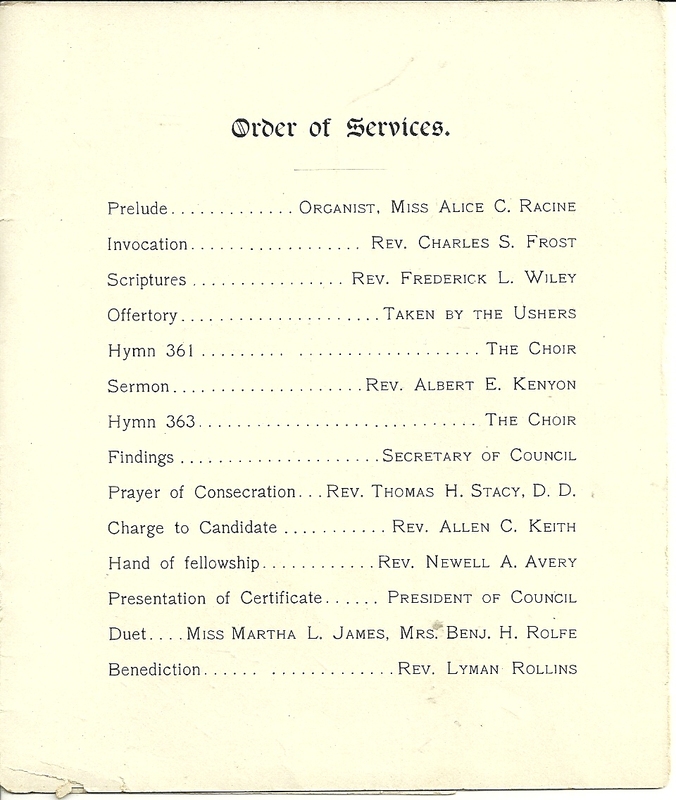 Brief genealogy of Rev. Rollins below. 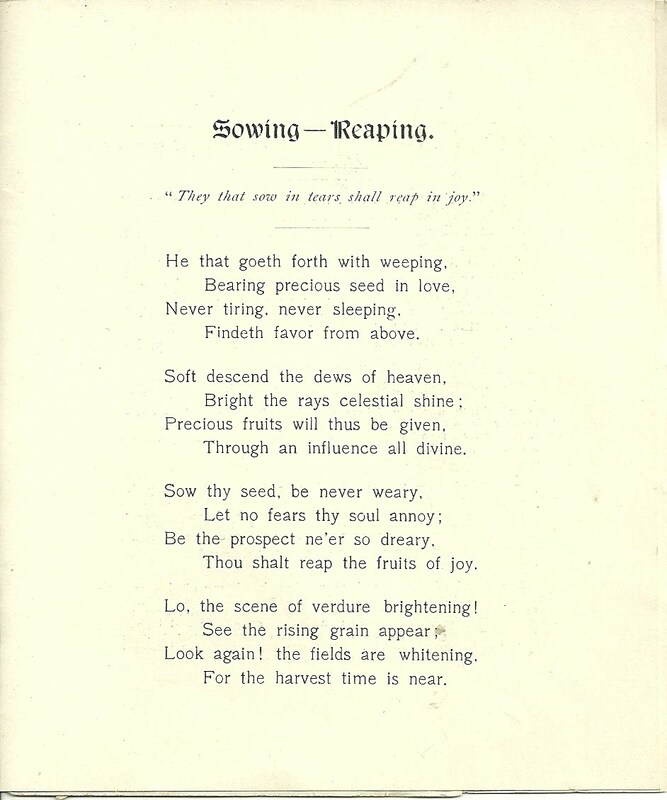 Note: See an account of Rev. Rollins' life on pages 4 and 5 in the September 2016 bulletin of St. Michael's Newsletter, from St. Michael's Episcopal Church, Marblehead, Massachusetts. Rev. Rollins served this church from 1915 to 1922, during which he also served as a chaplain in World War I and received the Croix de Guerre. Prayer of Consecration - Rev. Thomas H. Stacy, D.D. Concord is the natal city of Lyman Rollins. 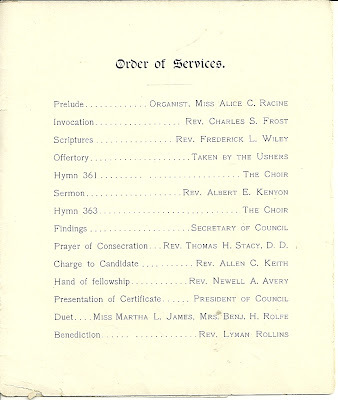 In early youth he was received to membership in Curtis Memorial Church, under the ministry of the Rev. Frank K. Chase, a former pastor, and has had sympathetic guidance by the successor of Mr. Chase, the Rev. Dr. Stacy. Mr. Rollins has spent more than six years in preparatory study, including graduation from New Hampton Institution and courses in Bates College. He has been officially connected with the Christian Endeavor Society and the Young Men's Christian Association. He has made good proof of his call to the ministry by efficient work done, and right results realized, in connection with several churches served by him while pursuing his studies. 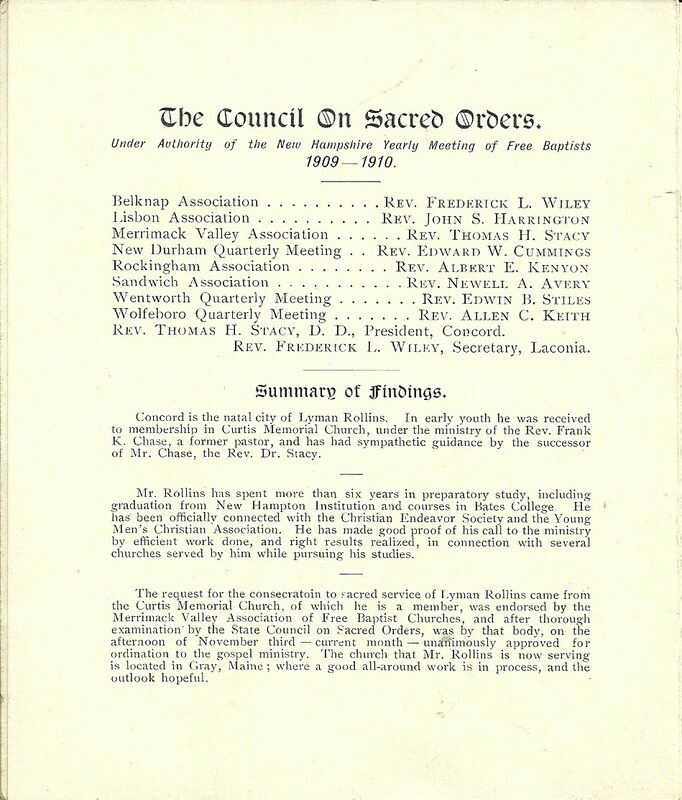 The request for the consecration to sacred service of Lyman Rollins came from the Curtis Memorial Church, of which he is a member, was endorsed by the Merrimack Valley Association of Free Baptist Churches, and after thorough examination by the State Council on Sacred Orders, was by that body, on the afternoon of November third - current month - unanimously approved for ordination to the gospel ministry. 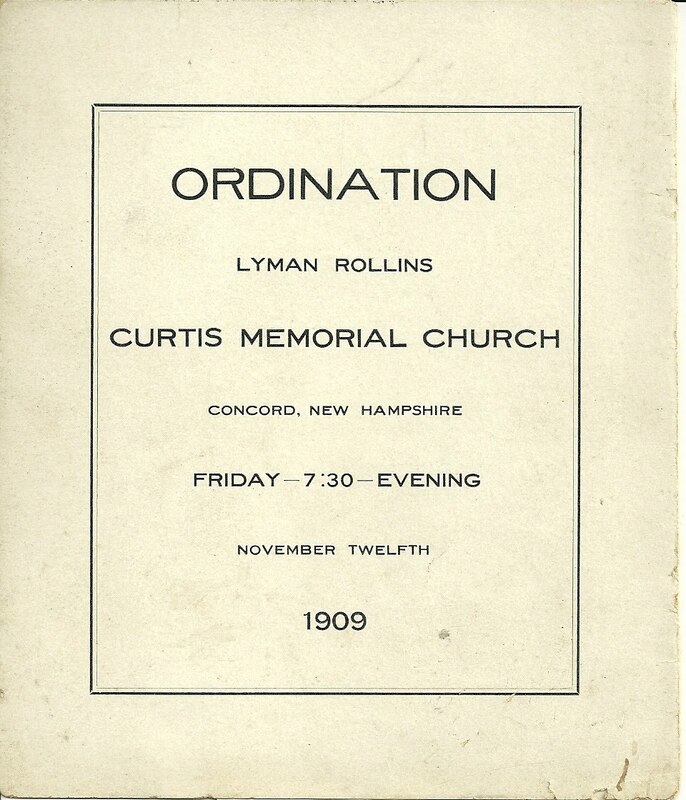 The church that Mr. Rollins is now serving is located in Gray, Maine, where a good all-around work is in process, and the outlook hopeful. 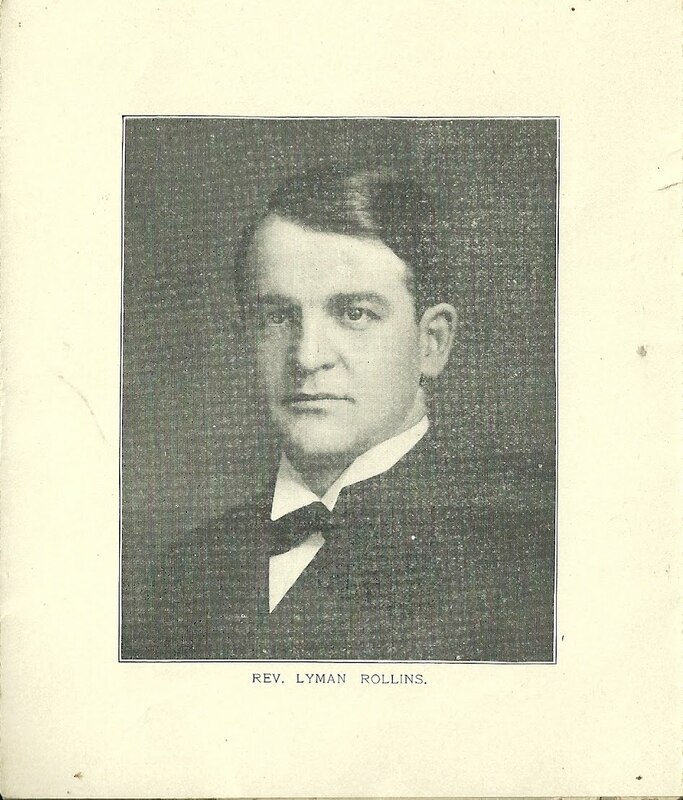 Reverend Lyman Rollins was born 26 April 1881 in Concord, New Hampshire, the son of Lyman Rollins and his wife Ellen Lucy (Carter) Rollins. 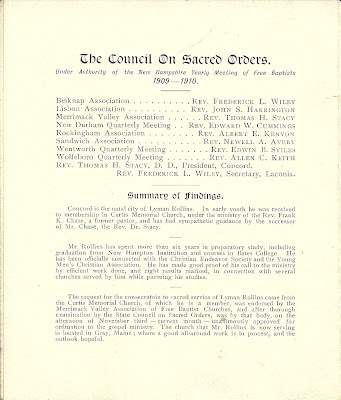 He received his education at the New Hampton Institution, Bates College (1906), Newton Theological School (1911) and Episcopal Theological School (1912). He served as a chaplain in the 5th Massachusetts Infantry in World War I. In the early 1920s, he was serving a church in Marblehead, Massachusetts. I'm not sure if he married; he was still single in the 1930 Census. Rev. Rollins had two brothers, Henry Louis Rollins, who became the New Hampshire State Veterinarian, and William M. Rollins, who worked for the railroad. His father died in 1892. 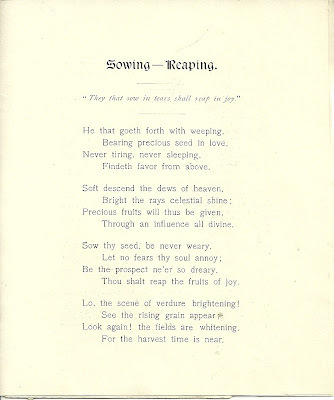 His mother later married Alva Young of Concord, New Hampshire. If you have any corrections, additions or insights regarding the information presented above, please scroll down to the bottom of the page for the comments box or contact me directly.